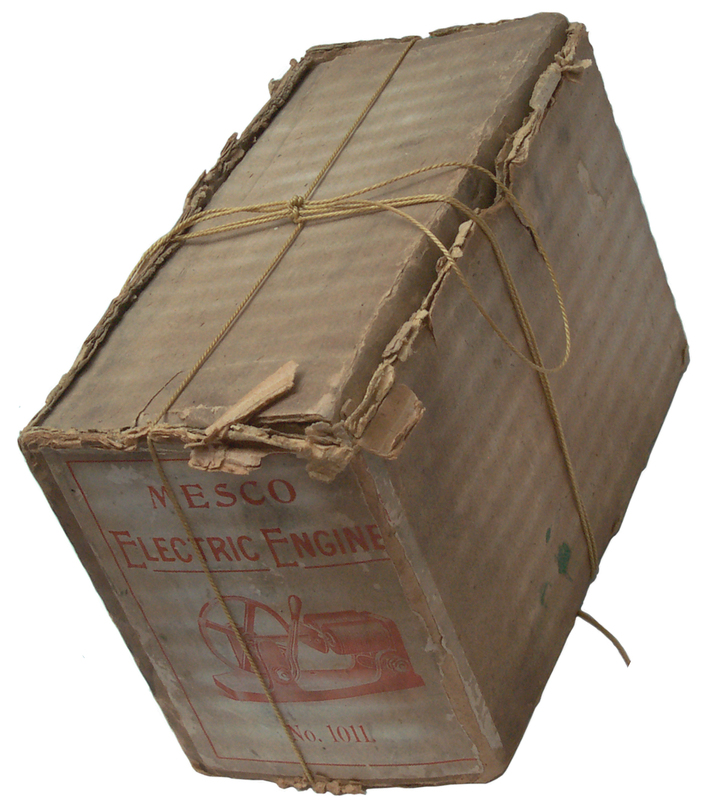 Manhatten Electric Supply Company (MESCO) made three versions of their patent Electric Engine. 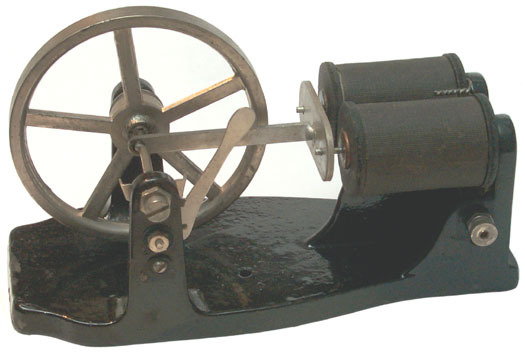 The 1011 with a 3½" flywheel, the 1012 with a 2 5/8" flywheel and the 1013 with a 2" flywheel. This is the largest version. 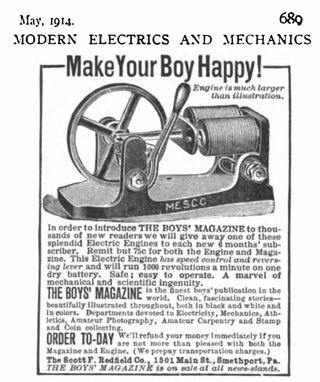 Charles E. Avery was granted patnet 958354 on May 17, 1910 and it was assigned to Manhatten Electric Supply Co.
New In Box doesn's seem correct but this electric engine comes very close. Excellent condition, instruction sheet included. Powered up and ran right out of the box, although I did apply a tiny amount of oil. Instructions call for one or more No. 6 Dry Cells connected in series. I tried using an Agilent E3617A bench power supply rated at 0 - 60 Volts, 0 - 1 Amp, but it was too weak. A single No. 6 Dry Cell turns over the engine and two of them make it run well. The instruction sheet shows three cells which would really put out some power. The crank has two throws, one for the connecting rod and one that acts as part of the switch and they are 90 degrees apart. If by chance the contact throw is pointing up or down working the control lever will do noghting and you need to spin the wheel by hand to get it going. This is the same for a single cylinder steam engine. But if the contact throw is close to either the forward or reverse contact then moving the lever so contact is made will start the engine without the need for manual starting. This is similar to the "Starting from the Switch" procedure on cars that had manual ignition advance retard controls, like Rolls Royce cars from the 1920s or 1930s. The lever not only allow for stopping, forward or reverse selection but also acts as a variable speed control.